I always love a good mail day, especially when anything paper is involved! I ordered these tags through Max & Bella as a final touch to my packaging for The Altered Abbey.. and boy am I ever pleased! Though I added the ribbons and holes myself (a fun activity to do while watching tv) … having them design, print & punch these was a HUGE timesaver this month.. and I’m ever so grateful! While I intend to design and print my own in the long run, It’s nice to know in a pinch I can get some quality goods from an indie site. Max & Bella offers a great variety of classy paper fun.. so send them some love! Keep in mind I dunno them at all, just a happy customer! Also, love your pieces below. It’s obvious that a lot of thought and emotion went into them. what cute little tags and a nice touch to your items too! Those are cute! Even the red dotted ribbon goes so well with the gingham looking ribbon. These are so classy and gorgeous! It’s amazing what a couple simple additions can do to bring out the best in another simple thing! Great going Chrysti!!! 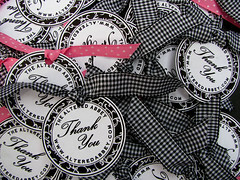 Thanks, Chyrysti, for posting my tags on your blog … they look great with the gingham ribbon. Who would have thought! :) Anyway, I just had to post and say hello. Please come visit again …. my shop is always open!